I seem to have a new favourite colour - Sweet Sugarplum! I'm also really enjoying the Blooms & Bliss DSP. I sat down with the purpose of making a card using the Blossom Builder bundle. 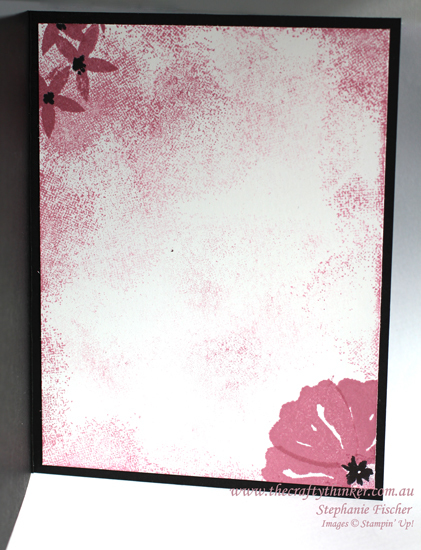 I started out by stamping the petals with Sweet Sugarplum ink onto Whisper White card. I used two of the larger petal layers with the watercolour look. There are 26 stamps in this set that has so much versatility - a watercolour approach, a linear approach or a combination of both! Having stamped all the petals, I punched them out and then sponged them lightly - adding more ink to the base and sides of the petal. 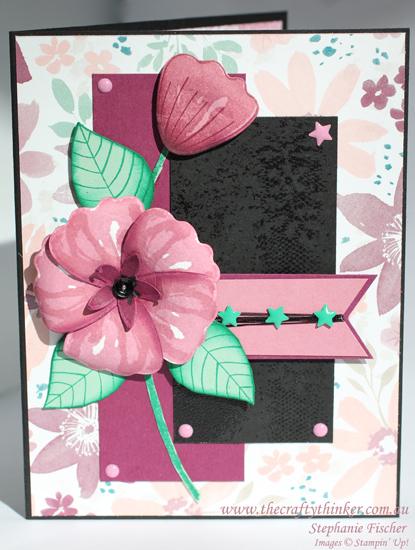 To save on wastage, I stamped the petals onto strips of cardstock and punched from left to right. I then followed a similar procedure with the leaves, using Emerald Envy ink. I stamped the stem a couple of times with Emerald Envy ink and then snipped them out. Sweet Sugarplum and Rich Razzleberry are such a good combination! 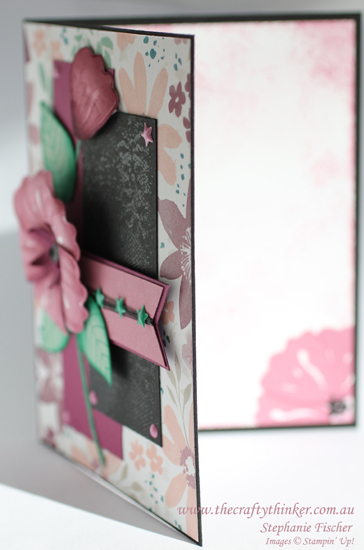 I made the base card in Basic Black cardstock and added a layer of Blooms & Bliss DSP followed by a piece of Rich Razzleberry cardstock. I clear heat-embossed the Basic Black panel using the lace stamp from the Touches of Texture stamp set and then adhered that to the front of the card. I made the banner from Rich Razzleberry and Sweet Sugarplum cardstock, using the Banner Triple Punch for the ends. Before adhering the Sweet Sugarplum layer of banner, I wrapped it with some of the Black Metallic Thread. To make the flower, I shaped the petals with my bone folder and then glued them to a spare piece of cardstock. I then added the Rich Razzleberry centre (a punched shape) and a black sequin in the very centre. I positioned the flower with a dimensional and then added the leaves, stems and one more petal (I added the lined stamp to this one) as a bud. The finishing touches were the In-Colour Enamel Shapes. For the inside of the card, I started with a piece of Whisper White Cardstock and stamped a petal in Sweet Sugarplum in the corner, masked it and added the remaining petals. Having removed the mask, I stamped the Basic Black centre. 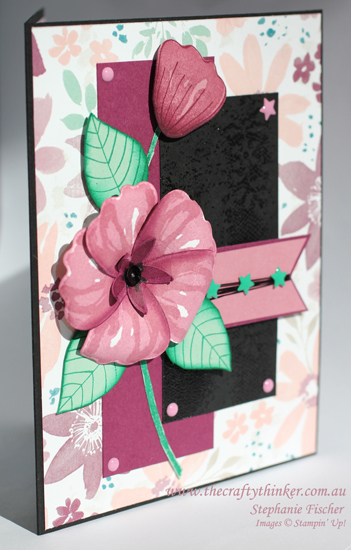 I then used one of the smaller stamps to place some Sweet Sugarplum flowers in the top left corner and then used one of the stampes from the Touches of Texture set and Sweet Sugarplum to randomly add colour, I stamped several times before adding more ink.